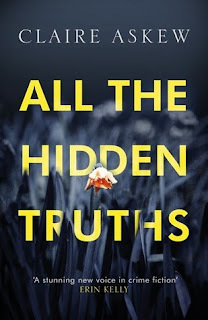 ALL THE HIDDEN TRUTHS - Clare Askew. Published: August 2018 - Hodder & Stoughton. Triggers/Content Advisory: Violence / extremely triggering subject matter, please be warned. All the Hidden Truths is the story of a tragic shooting at an Edinburgh college and its aftermath. It is narrated by three women at the heart of the story - the mother of a victim and the mother of the shooter, and DI Helen Birch who is tasked in solving the case. Two words: Emotionally unprepared. knew it would be heavy, but I didn't realise just how heavy. I didn't realise I would be crying - sobbing - on literally every page in this book. Apparently Askew is known for her poetry, but her prose in this book goes from an awkward expository style to sensitive and incisive language that keeps digging deeper into the story and the characters. Admittedly, I didn't love the first chapter, but after that I was hooked. Her writing style easily grew on me and by the end of the book I was in love. It goes without saying that this story is difficult to read. It's disturbing, it's utterly heartbreaking, and it hits close to home. But the pacing is perfect, and as you sit sobbing your soul out, the author actually gives you the time to grieve, to come to terms with the characters' losses, and then to breathe and keep going. It's so tenderly and sensitively written that you feel as if you're going on a journey with the characters and you get to deal with the pain just as they do. It's brilliantly handled. But while I sobbed every second page (it's that emotional) I was also absolutely gripped and riveted by the story. The tension doesn't let up for a moment, and with every line coursing with compassion, you're in for a breathless, terrifying journey. It's like the author grabs your heart in her cold fist and squeezes and squeezes and doesn't let up till days after you've turned the last page. And yet at the same time, empathy is bursting from the pages in waves. It's a scary tale, but also achingly understandingly. I love how the author grapples with the topic. It makes you think, it makes you question, and while she never delivers a real reason for why Ryan did what he did, she leaves us with perhaps the most painful lesson of all: sometimes we don't get answers. Sometimes we don't get goodbyes. Sometimes, all there is is desperation and agony and us screaming why why why into a void. I think the following quote captures that sentiment brilliantly. ❝ It's like I'm fumbling around in this terrible darkness. I'm trying to find a lever, or a switch - something I can press that will flood everything with light, and make it all seem alright again. If I can find that switch, I'll find myself in a brightly lit room, and on the floor in the middle of it will be written the reason - the reason - why my son...why my son killed those thirteen women. The darkness is the question: why, why? And the light switch would give me the answer. But I don't think I'll ever find it. I think I'll be staggering around in that darkness for...well, for the rest of my life." The characters are exceptional. There's Moira, whose son shot the thirteen women. There's Helen, the detective in charge of handling the case. And there's Ishbel, whose daughter was the first victim. Askew writes each women phenomenally; they're all so well nuanced and vivid. I also loved reading the story from 3 very different perspectives - it was so insightful and interesting. They each brought something different to the story and that took it so much further. Searing, compassionate, profound, and unflinchingly agonising, All The Hidden Truths is an outstanding novel following three very different women as they grapple to find closure and justice in the centre of an unthinkable and unexplainable tragedy.